Forever Black Tire & Trim Reconditioner is now thicker and easier to apply! The kit now also includes a hand held applicator brush for easy application. 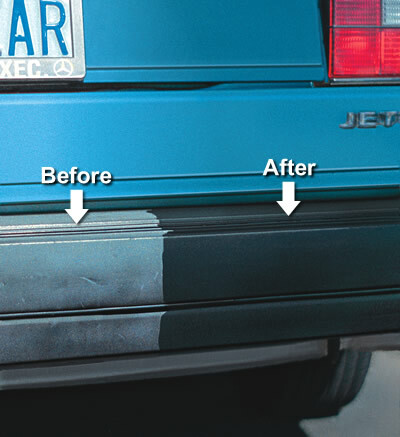 The permanent solution to sun-faded bumpers and trim moldings. Forever Black restores a dark, black, finish on sun-faded bumpers and body moldings. This is not a cosmetic dressing. It’s an easy-to-use permanent dye. It permanently colors black plastic, rubber and vinyl with the same polymers that the manufacturers use. It is not a silicone dressing – silicone products will make plastic, vinyl and rubber appear to have regained their color but the change is temporary. Plus, silicone oils have been known to dry out the applied areas creating a bigger problem. Silicone also tends to leave a greasy residue even after buffing. How is Forever Black Different? 1. Forever Black permanently dyes black plastic, rubber and vinyl. 2. Forever Black will completely cover the worst wax build-up or sun-faded trim. 3. Forever Black will not wash off. 4. Forever Black dries in 5 to 20 minutes. No buffing is required. 5. Once dried, Forever Black will not attract dust. There is no oily residue. 6. Forever Black has a UV sun screen to help shield against future fading. 7. Forever Black will restore bumpers, spoilers, mud guards, door handles, body and trim moldings to a like new condition. Please Note: Forever Black Bumper & Trim Dye is intended for porous, textured surfaces. Smooth plastic, vinyl, and rubber may not be able to absorb the dye and it will therefore streak. Kit will cover the trim on 3 to 4 cars.